Misha Brusilovsky was born in Kiev in 1931. From 1945 to 1952 he studied at the T Shevchenko Art School in Kiev, and then at the Academy of Arts in St. Petersburg, which he completed in 1959. He paintes many outstanding portraits and works on a large series of pictures dealing with ancient mythology and New and Old Testament themes. Most importantly, he has managed to create his own original, author’s style, in which traditional painting unites with avant-garde. 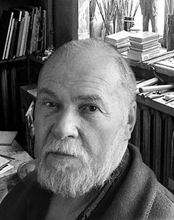 Anatoli Kantor, a prominent expert on contemporary Russian art and President of the Academy of Art Criticism, characterized Misha Brusilovsky’s paintings thus: “The main characteristics of Misha Brusilovsky’s pictures are outline, lightness and smooth-flow, which create an overall impact of a vital, mobile, transparent environment, which gives birth to fantastic images, legends which rise from the depths of the subconscious, from the troves of popular memory and folklore. This gives Brusilovsky’s work its rippling, meaningful and changeable character, love of strong metamorphoses, unexpected transformations and reflections, they create a world in which imagination and reality merge and change one into the other. This ability to a theatrical transformation of history into legend, life into a game of the imagination, have placed Brusilovsky’s works among the most outstanding and original in today’s Russia”.